After a closer look, readers of the bulky document discovered that in the Sub-chapter 16 the draft decree laconically declared that all permissions given to the “Masters-program in gender studies” were simply revoked. Members of the Hungarian Rectors’ Conference could not believe their eyes and put this disbelief in their scorching criticism in their joint comments forwarded to the government. This Hungarian government’s proposed decree, if accepted, would cancel an accredited, well-performing MA program in gender studies with consistently high enrollments with excellent placement records. Two universities are offering this program in Hungary, both based in Budapest: the private Central European University in English and a public university, Eötvös Loránd University (ELTE) in Hungarian. The draft decree did not offer an explanation neither for the reasons nor for the urgency to pass it within 18 hours but since the press has leaked the draft decree, different government politicians have been giving different explanations to the press. First, government officials came up with the argument of economizing taxpayers’ money as they plan to finance more strategic study programs promoting the government’s main aim: demographic growth. However, the program at CEU is not financed by the Hungarian taxpayers as it is a private university. The tuition fee of ELTE for the ten students is 2700 000 Hungarian Forints, less than 8000 euro for a whole academic year. So, one wonders what the real motives are behind this bill. Then the government came up with the argument “there is no need for these graduates in the labor market”. It is to be noted though, that CEU has 139 graduates from this program since 2006, and, according to an alumni report, the graduates have landed great jobs from Kirghizstan to Iceland and Great Britain in higher education, economy, culture and finance, as this program mostly admits international students. The first cohort of the program at ELTE launched in 2017 will graduate in July 2019 so no data is available about their future placement. The next argument from authorities was the lack of students’ interest in the course – a claim made without any data supporting it. At CEU, for the 22 places available, usually more than 200 students apply, and the number of admitted students at ELTE (ten) was defined by the ministry, not by the increasing student interest. The brainstorming stopped when on 1 September the Hungarian Accreditation Committee (HAC) issued a statement that it had not participated in preparing the draft of the government proposal to revoke the license of the master’s program in gender studies. The HAC stated it does not endorse the professional and academic arguments used to justify the proposed revoking of the license. So the government appears to be the only institutional actor responsible for proposing a strongly ideological and political intervention in shaping an academic study program. This is violating freedom of education and professional standards. It is not a surprise that gender studies programs were targeted by the Hungarian government as ‘gender serves symbolic glue’. The concept of ‘gender’ is used to mobilize very different political forces to construct one, united enemy to hate, in this case, the gender studies scholars and practitioners. Also it has become a central rhetorical tool of those efforts that try to determine for the wider audience what “pure reason” should mean, and thereby try to create a new consensus of what should be seen as normal and legitimate. That the kind of social mobilization that incites hatred against the “gender ideology” and against political correctness is not only demonising the worldviews of its opponents and rejecting the human rights paradigm that has for a long time been the basis of the relative consensus in Europe and North-America, but is also providing an alternative that is realistic and seems acceptable to many people – as it is focusing on the family, the nation, religious values and the freedom of speech. Hungary was recently called a ‘laboratory’ by Prime Minister Orbán in his speech in London as the trends in Hungary might be used by other European countries as successful political strategies to win elections promising safety and feeling of belonging. The question for the upcoming European Parliamentary elections will be if this dangerous precedent will be instrumentalized to create a majority for the populist forces or if it will mobilize voters to protect liberal and democratic values. Reviewing the brief but stormy history of the draft decree of banning gender studies in an EU member country, we see that the coin can flip both ways, and the stakes cannot be higher when waiting for the government to decide. This piece is an extended version of a post first published on The Progressive Post on 22 September 2018, re-posted here with permission. This blog post is part of a series of posts on transnational anti-gender politics jointly called by the LSE Department of Gender Studies and Engenderings with the aim of discussing how we can make sense of and resist the current attacks on gender studies, ‘gender ideology’ and individuals working within the field. 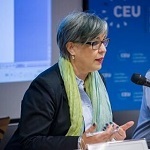 Andrea Pető is Professor in the Department of Gender Studies at Central European University, Budapest, Hungary and a Doctor of Science of the Hungarian Academy of Sciences. She has written five monographs, edited thirty-one volumes and her works on gender, politics, Holocaust and war have been translated into seventeen languages. In 2018 she was awarded the 2018 All European Academies Madame de Staël Prize for Cultural Values. Thank you for this article, it is very valuable to know the whole story and the hard facts in response to Hungarian government arguments. However, I was wondering why did you choose to illustrate the article with this particular photo? Firstly, it was taken in Warsaw, Poland and not Hungary and the poster presented on it as well as writings in the background are in Polish, not Hungarian. Secondly, the caption on the poster visible in the photo along with the word “Gender” crossed out says “Hands off children!” and while it shows different problems with not understanding what gender is and treating it as some sort of ideology that aims at sexualising children, I feel like it is a completely different subject. Now as a Pole, I recognise that Poland may have a lot of problems with gender that are similar to those in Hungary, but I think if the aim is to write righteous, reliable articles, the visuals used should reflect that and be related geographically as well as thematically. Thank you! Thank you for your comment about the photo, we debated the choice of picture at some length within the editorial collective. Our aim is always to use an image that is both geographically and thematically appropriate. We had tried hard to find a good visual from the Hungarian context and had many contenders but unfortunately none of them had a creative commons licence so we would be free to use it to illustrate the blog post. In the end, despite being from the wrong geopolitical context we felt that this image of a poster with the word gender crossed out captured the sentiment of the text of gender being forbidden. It was not our intention to mislead or imply that the anti-gender politics are the same in the two countries and so we welcome the context your comment provides for other readers.